DELAWARE STATE Vending Machine Companies! 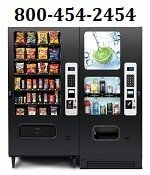 Offering Free Vending Machines: Snack, Soda, Coffee, Food, Frozen, Healthy, Micro Markets, Amusement Games and machine repair services, for your employee breakrooms. Please contact these vending machine operators directly for more information about their vending products and services. Annan Distribution Service – Full Line Vending Machine Service Suppliers – Wilmington, Delaware. RJM Vending – Office Refreshment Service, Snacks – Soda – Juice – Candy – Bottled Water, Complete Coffee Service, All Inquires Welcome, Wilmington, DE. United Vending Service – Full line of vending services, Snack, Soda, Candy, Food, Coffee, Water and more! Based out of Wilmington, DE. William Anthes & Son Vending – Used Vending Machines, Financing Avail., Location Service, Coin Mechanisms, Bill Validators. Company is based out of Bear, Delaware.